What do you have to say as a feminist group about the recent videos? Seventies women’s advocates used to complain that the pro-life movement saw women as “host beings.”Now we know who really sees women as host beings and who is treating our children as chattel. Feminists for Life’s mission is to address the unmet needs of women so that they never consider abortion. When we say WOMEN DESERVE BETTER® we mean resources and support. Let’s work together to make abortion unthinkable. But what do we, as pro-life feminists who seek solutions, say to students and to women who mourn? I had an abortion many years ago. These videos have brought back the nightmare of what drove me to abortion, every detail of that day, and so many regrets. 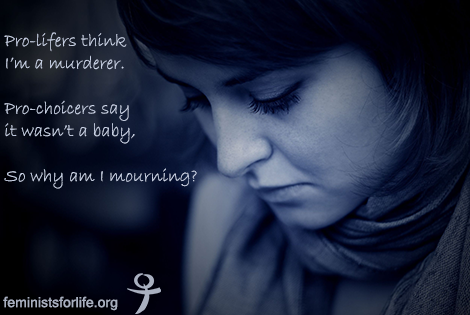 My pro-life friends think I am murderer. My pro-choice friends say it wasn’t a baby so they don’t understand why I regret my decision and why I mourn for my child. I don’t feel like I am welcome anywhere and I can’t stop crying. To any woman and man hurt by abortion and who regret their decision or participation, you are welcome at Feminists for Life. But first we hope that you would consider contacting Rachel’s Vineyard, Project Rachel, or get a referral to a qualified counselor who understands reproductive grief — perhaps through your local pregnancy resource center. You will find hope and healing from those in these groups, and you will find unconditional love and support here at Feminists for Life. We are dedicated to systematically eliminating the reasons that drive women to abortion — primarily lack of resources and support — so that NO woman feels driven to abortion. Why? Because women as true champions of equality we recognize that every child deserves life. We are about to launch a new school year, a new opportunity to reach a generation who knows abortion as the status quo. We want to offer kits and posters, technical training, lectures, workshops, and of course our FFL Pregnancy Resource Forums. If our Annual Capitol Hill Intern Briefing is any indication, then we know this year is going to be amazing. But we can’t do what we need to do without your support. Think of how many we have been able to reach with the support of people like you — and how many we can reach again this year. We already have inquiries from students across the nation including requests for help from some pro-life groups whose budgets have been slashed or cut entirely!! I don’t want to turn them down. Will you please help us help them now? People tell me that summer is a terrible time to fund raise. I get it. There are oceans to surf and mountains to climb. But if you want a real challenge, then join me now. Sponsor their kit ($75), lecture or FFL Pregnancy Resource Forum ($1-3,000 depending on a size of the school, distance and expense of the city). Let’s make our pro-life student groups the real champions of women’s rights on campus.